If fantasy and wonder are things you look for in music, look no further than “Sattyg,” the twelfth release by Swedish group KAIPA. I had never even heard one of their albums before this one landed in my promo queue, but I can safely say that the band’s unique combination of progressive and folk elements make for some interesting listening. The main thing about the compositions on “Sattyg” is that they are *compositions* in every sense of the word; four of the album’s seven songs pass the seven-minute mark, and three extend over 13 minutes, with each comprising of multiple shifts in mood and instrumentation. While there are many strong, memorable moments, a listener without much patience isn’t going to be able to appreciate what KAIPA is going for. These songs take time to develop, but the reward is worth the investment more times than not. The folk element is particularly noticeable on ongs like “Screwed-Upness” and the title track,with really whimsical flute and acoustic guitar parts that give the impression of something like the upbeat soundtrack to a Rennaisance Fair, in a very cool way. It transitions into a kind of psychedelic, almost jazzy interlude with some very freeform beats and almost 70s-like keyboards along with its airy soundscape. As a guitarist, I couldn’t help but latch on to the emotive lead playing of Per Nilsson, who absolutely slays on every song. It’s not even that he plays the craziest material technique-wise, though he certainly proves he is capable on tracks like “A Map Of Your Secret World” and the beautiful “A Sky Full Of Painters.” Rather, it’s more the sheer variety and consistent quality of his melodic leads, which extend for minutes on end while maintaining a high level of audible enthusiasm, flooding the album with vibrant sonic colors. The vocal tandem of Patrik Lundström and Aleena Gibson is also superb, which brings me back to “A Sky Full Of Painters.” Of all the songs on the album, this one is probably the best executed of all. The soaring melodies, airy tone and uplifting vocals give the feeling of floating, almost drifting away on a cloud. There are audible bits of PINK FLOYD at various points in the song, adding another dimension to the band’s already diverse palette. 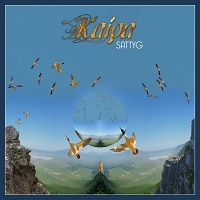 While each track is enjoyable in its own way, taking the time to listen to “Sattyg” straight through can be a rewarding experience with some patience and an appreciation for intricate, folk-influenced Progressive Rock. It’s not one of the most immediately accessible records out there, but certainly one of the most different.